NOTE: Due to a switch in code signing certificates, it is recommended you uninstall EVADE and reinstall the latest version from this page. Prior versions will still automatically check for updates but you may get warnings that the provider is not trusted. 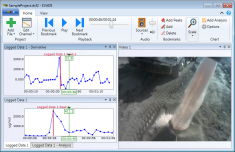 The Enhanced Video Analysis of Dust Exposure (EVADE) software program merges video files and logged data files, allowing the user to view them simultaneously to help identify exposure sources. Version 2.0 has been completely rewritten from the ground up. Based on the success of EVADE 1.0 and feedback from the EVADE user community, the function and capabilities have been expanded to make a more flexible and more powerful tool. It still remains the software component for Helmet-CAM. The Helmet-CAM procedure was developed by researchers at the National Institute for Occupational Safety and Health (NIOSH) and is a technique that uses a video camera worn by the worker to provide a visual record of the worker’s activities concurrently with data collected by a real-time data logging aerosol monitor also worn by the worker. Addition of log file importer for the AM520. Addition of extracting units for the AM510 importer. Update to the PDR1500 importer to handle European notation of using commas in place of decimal points. Update of the Generic CSV importer to handle European notation of using commas in place of decimal points. Share project bug fix (3/20/2017): Eliminates "..error while packaging the file..." error that was occurring when Share Project was used from the File menu. Usage metrics added (3/15/2017): A voluntary option has been added to allow the application to report usage metrics to help improve the quality and reliability of the EVADE software. Expansion beyond just dust exposure. EVADE has become more generic to allow the playback of any video stream against any logged data stream. Multiple channels. Multiple video channels and multiple logged data channels can now be created in a single project. File stitching. Multiple files, video, or logged data can be added to a single channel for seamless playback. Advanced windowing interface. All playback channel, project editor, and bookmark windows are now "drag and drop" capable. This enables them to be stacked or grouped in any configuration and docked or undocked from the main program window. This is especially beneficial for large multi-channel projects and computers with multiple monitors. Redesigned project editor. A new project editor provides a visual reference for all channels. Each imported video or logged data file can be offset in time to get all data streams correctly synchronized. Share a project. A project can now be packaged and transferred to another computer where it can be opened and viewed, complete with all video and logged data. Basic data analyses. Simple analysis functions such as Max, Min, Mean, Derivative, and others are now available to apply to any logged data channel. User-defined analyses and file importers. There is now a facility for creating custom data import and analyses functions. This is accomplished by creating a custom plugin that is placed in a specific EVADE folder and made immediately available for use without recompiling the program. Improved installation program. A new installer allows EVADE to be installed without the need for Administrative Rights. In addition, on startup, the EVADE software will automatically check to see if there are any updates that can be downloaded (if the PC has an Internet connection). Download this ZIP file and extract to a local folder. A Visual Studio project containing the framework to create a custom analysis or importer plugin. Click the download icon and select RUN. Download and unzip the offline installer to a local folder. Open the Installer folder and run setup.exe. Send any questions or comments regarding EVADE to mining@cdc.gov. Here Comes The Helmet-CAM: A Recent Advance In Technology Can Improve How Mine Operators Investigate and Assess Respirable Dust.